Rounded edges and mouldings with simple construction give this sofa table a casual style.Designed with a modern plinth base that doubles as a shelf and two drawers to give you a discrete place to store coasters, playing cards or display decorative items and more. Bathed in a dark toffee finish over cherry and birch veneers this table is adorned with simple satin nickel bar drawer pulls. Place this table behind a floating sofa or against an open wall for a complete, cozy design. 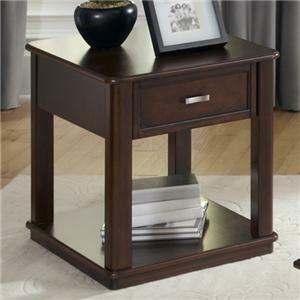 The Wallace Casual Sofa Table with 2 Drawers by Liberty Furniture at Hudson's Furniture in the Tampa, St Petersburg, Orlando, Ormond Beach & Sarasota Florida area. Product availability may vary. Contact us for the most current availability on this product. Drawer / Shelf Construction Boxed Drawer Construction. 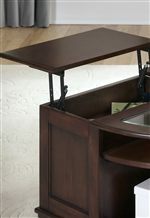 All wood dovetail drawer construction; dust proofing; screwed flush mounted back panels. 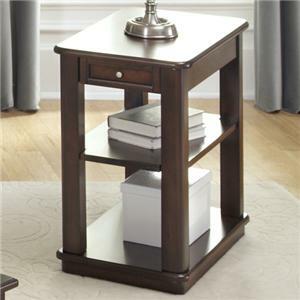 The casual style of this collection makes it easy to use in any home. 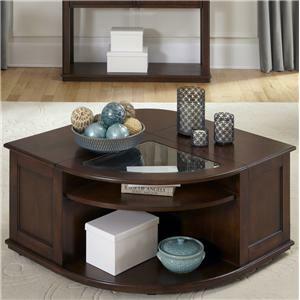 Comprised of occasional tables and entertainment pieces you can create the perfect living space for you and your family. 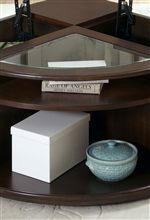 Each piece is artfully crafted from cherry and birch veneers over hardwood solids and bathed in a gorgeous dark toffee finish. Satin nickel hardware accents select pieces and gives an eye-catching contrast to simple drawer faces. Rounded edges and mouldings complete the simplistic, casual style of this collection. The Wallace collection is a great option if you are looking for Transitional furniture in the Tampa, St Petersburg, Orlando, Ormond Beach & Sarasota Florida area. 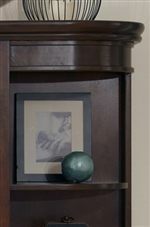 Browse other items in the Wallace collection from Hudson's Furniture in the Tampa, St Petersburg, Orlando, Ormond Beach & Sarasota Florida area.